BBC NEWS | Business | Whatever happened to 'Lucky Luc'? Whatever happened to 'Lucky Luc'? Luc Vandevelde's four-year reign at the helm of Marks & Spencer is finally over. The past few months with the iconic retail giant have not been too smooth for the man once dubbed "Lucky Luc" . 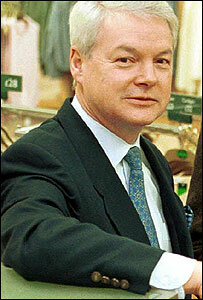 The man once credited with helping M&S turn the corner has faced a barrage of criticism from shareholders. He was accused of a lack of commitment to the troubled group. One fellow director described the part-time chairman as "totally detached". His heart was just not in it any more. Mr Vandevelde joined M&S in 2000 with the task of reversing sliding sales. But he failed to live up to his early promise and appeared more interested in his other corporate commitments. "It seemed that he had rather lost interest," commented one retail analyst on news that Mr Vandevelde had decided to quit. So what happened to the man touted as Mr Turnaround, the saviour who was hired to steer the UK's flagship retailer back into profit? When Luc Vandevelde joined M&S in February 2000, the company had been buffeted by two years of dwindling sales and failed revamps. Shoppers had defected to trendier boutiques like Next and Monsoon and the year before Mr Vandevelde rode into town M&S had issued two shock profit warnings, wiping a third off its share price. Investors hoped cool-hand Luc would be the man to take M&S back to its position as the high street superstar of the mid-1990s. Belgian-born Mr Vandevelde had been a lifelong retail executive who previously steered French supermarket chain Promodes into a merger with its biggest domestic rival Carrefour. Taking over at M&S was risky. He effectively staked his reputation on successfully pulling it out of the quagmire and famously promised to resign if the company had not turned the corner in two years. And he delivered on his promise. The golden-boy's confidence was not mis-placed and by May 2002 things were looking rosy again. 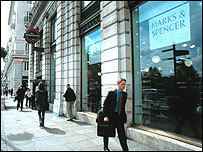 In 2002 M&S announced its first annual profits increase since 1999 with figures that beat the City's expectations. Shareholders forgave Mr Vandevelde for the previous year's disappointing sales figures which saw him waive his rights to an £816,000 bonus. And a notoriously expensive TV ad campaign designed to appeal to the "normal" woman was quickly scrapped. The 30% rise in profits for M&S proved lucrative for Mr Vandevelde, who pocketed £2.2m in salary and bonuses. One of his most controversial decisions was to pull out of continental Europe, closing 39 stores and axing about 5,000 jobs at a cost of £300m. The move sparked waves of protests from shoppers abroad and resulted in a damaging labour row with trade unions in France. Deciding to concentrate on matters closer to home, Mr Vandevelde and current chief executive Roger Holmes employed designer George Davies to create more sophisticated fashion ranges such as Per Una women's wear while upgrading stores in a bid to regain market share. But by July 2002, Mr Vandevelde had already decided to scale back his involvement in running the company and he began eyeing up attractive opportunities on the board of other companies. M&S felt so confident that it had the winning formula back in its hands that Luc handed the job of chief executive to former managing director of M&S UK Roger Holmes. In a seemingly honourable move, Mr Vandevelde even opted for an all-share pay deal which meant he was no longer eligible for a bonus or pensions contributions. "It is a vote of confidence in the team and in the plans for the company, that in future my remuneration is closely tied to the value which we create for our shareholders," he was quoted as saying. "If the company succeeds, I will do well." Meanwhile, declining sales and profits looked like a thing of the past at M&S until the company's comeback began to stumble at the start of 2004. Same-store sales dipped 3.4% in the fourth quarter as demand for former women's clothing faded and M&S's shares of the UK clothing market fell for two straight quarters. Alarm bells were ringing again. As profits and sales began to drop again, directors of Marks & Spencer were anxious that Mr Vandevelde should commit more of his time to the company, or quit. But his mind was on other things. Since going part-time, Mr Vandevelde founded Change Capital Partners, the private equity chain that recently bought Robert Dyas. He also rejoined the board of Carrefour, the French supermarket chain, to represent the Halley family after Paul-Louis Halley died in a plane crash last December. Speculation was beginning to grow that Mr Vandevelde was planning to work full-time again for Carrefour. "There is growing concern that Luc Vandevelde's attention is straying, just at a time when M&S needs a strong chairman to be on top of things," said one shareholder. As the pressure mounted Mr Vandevelde finally announced his resignation from the £420,000 a year post, citing personal commitments to the French Halley family. It could be full-circle for "Lucky Luc".